Light is the link between our bodies and the solar day. We evolved under the sun for millions of years and are closely attuned to the daily light/dark cycle of the sun. This is our circadian rhythm. Modern technology is catching up to the sun. Between recent advancements in LEDs and controls, we now have access to the finest human-centric lighting systems since the, uh, sun. While interest in human-centric lighting is growing, there are still several obstacles to its full adoption. Energy-efficient lighting helps the planet and lowers utility bills—both worthy goals in themselves. Plus, it’s really easy to measure how energy-efficient lighting trims costs for a business. However, the next level of ROI goes beyond comparing electric bills. Instead, looking at employee productivity and satisfaction levels. A tiny uptick in employee productivity can deliver enormous ROI for a company—far exceeding energy savings. Based on typical expenditure rates for utilities versus labor, a one percent improvement in productivity can outweigh a 100 percent improvement in utility costs (see more). The policy landscape on this issue has not kept pace with the changing technology and regulatory bodies tend to focus on energy efficiency, to the detriment of companies looking to improve their lighting. For example, high-CRI light sources—while highly efficient compared to legacy lighting—may not meet DLC standards, thus making them ineligible for many utility rebates. This is unfortunate, since lighting with higher color quality delivers more comfortable lighting and improves visual acuity. Additionally, fixed-value energy efficiency and illuminance requirements can be impediments for proper HCL systems. 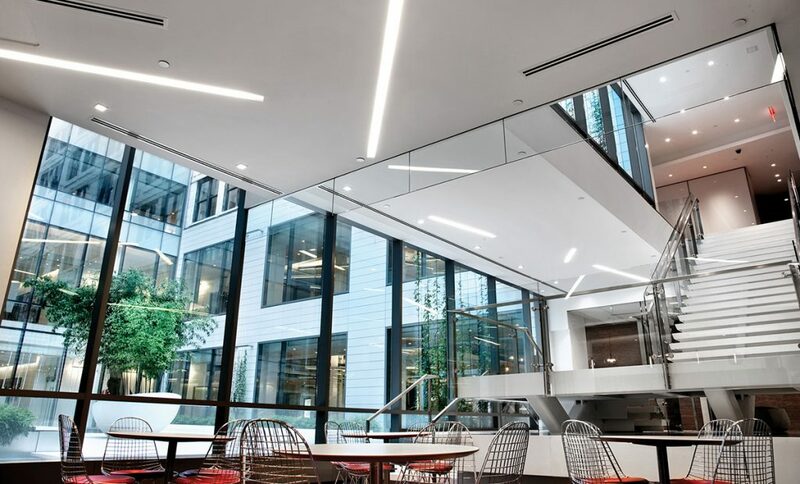 By their nature, human-centric lighting systems are dynamic—drawing more or less power and delivering more or less illuminance based on the needs of the moment. Peak-load energy consumption by a human-centric lighting system could easily exceed those limits at times, while still averaging significantly more efficiency than a conventional system. Human-centric lighting systems are premium products and they have more parts involved than typical lighting. The high-end products involved come with a commensurate cost. Many organizations have difficulty justifying the expense, especially if they have already upgraded to LEDs in the past and thus can’t claim energy savings as a rationale. Technology costs typically go down though over time. Already, human-centric lighting system costs are decreasing. It’s very possible that a quality lighting system is more affordable than clients may think. Additionally, when the numerous productivity benefits of human-centric lighting are added into the calculations, the payback period can be far shorter than the upfront price reflects. Studies have shown that human-centric lighting systems make for happier, healthier employees who get way more done. Plus, healthier employees call in sick less often. A common complaint with office lighting that is centrally controlled is that the users can’t adjust it to fit their preferences. Just like how one-size-fits-all clothing doesn’t fit anyone perfectly, the same applies to lighting. 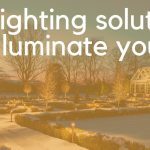 The human-centric lighting system may be designed according to all the latest research and best practices, but it likely won’t be able to fit every user’s need all the time. 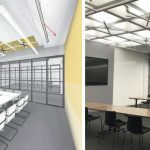 It’s better to offer either individual task lighting that users can adjust, or break up the space’s lighting into separate, controllable chunks. This way, users are empowered to manage their own productivity, rather than looking for ways to circumvent the carefully designed human-centric lighting system you implement. Good things to put on automatic or central controls are window shades and common area lighting. With shades especially, a common daylighting problem occurs when the building occupants close the shades and then leave them down. Adding photocells to the automatic shades prevents glare in the early morning and late afternoon when the sun is low, while capitalizing on the sunlight for the rest of the day.